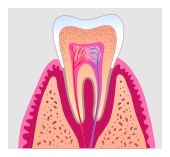 When a root canal treatment fails, the first course of action is to attempt to redo the root canal treatment. It is usually done by an Endodontist (root canal specialist) or an experienced general dentist. The process is very similar to root canal treatment. The difference is that besides taking any remaining infected tissue out, the doctor has to take old filling material, any posts and crowns, or any other obstacle in the pulp space out to be able to successfully disinfect and seal the area of the root canal. After the root canal treatment is done, your restorative dentist will place a crown to protect the tooth against fractures.